Szekeres, P., A.D.M. Wilson, C.R. Haak, A.J. Danylchuk, J.W. Brownscombe, C.K. Elvidge, A.D. Shultz and S.J. Cooke. 2017. Does Coastal Light Pollution Alter the Nocturnal Behavior and Blood Physiology of Juvenile Bonefish (Albula vulpes)? 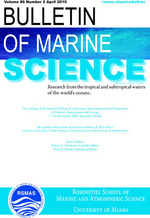 Bulletin of Marine Science. 93: 491-505.